Grandma, or Nǎinai, gave me her last hug in January, 2019. This marked her 91st year. I’m not exactly sure when her real birthday was, her paperwork got a little messed up somewhere when she moved to America. My understanding is that her real birthday, not the birthday in her paperwork, was August 1927. We’re able to pinpoint her age because she always knew, even in the middle of the dementia, that she was the year of the rabbit. Even when she incorrectly insisted that she was only 82 years old, and when she thought I was still at UCLA, she knew, and proudly proclaimed, that she was a rabbit. There were constants that withstood her dementia; remembering that she was a rabbit was one of them. 91 years took its toll. She started developing dementia around age 82. Time froze for her from then on out, even if many of her other functions continued. Memory of what she did only seconds prior started to fade away. She wanted to keep us safe, so before going to sleep, she would walk from the bedroom to each and every door, to check if they were locked. She would get back to her bed, and mutter “better safe than sorry”, and shuffle out to each door again. When I came home, she was always so excited to feed me. While her taste had deteriorated, she wanted nothing more but to make sure I was fed. If I ate, however, she wouldn’t remember, and offer me another meal. She only wanted to help, but her dementia turned her offering and gifts of service into a non-stop barrage of questions — a broken record and an unresolvable conversation that would span hours. Grandma may have forgotten things she did seconds prior, but she never, for a second, forgot what she wanted. She only wanted to help. That’s all she ever wanted. This was a unshakeable constant for her. Later on as her strength faded, she would take a nap on the couch, only to startle herself awake and blurt out the first thought on her mind, loudly and to no one in particular. “Is there anything I can do to help”? Grandma moved in with our family 30 years ago, when my older brother was born. I’ve never known a family without her. Mom then started her PhD and dad his medical residency. Many single friends struggle with either of these in isolation. In my eyes, our family was only possible with gram. 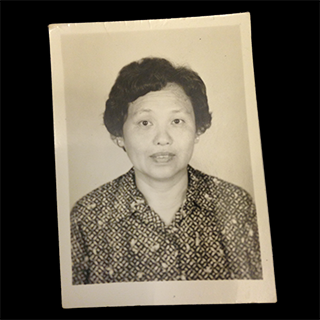 Grandma was born in Shanghai, China, and moved to Hong Kong when the Japanese invaded. I never knew the full story, and she only told me bits and pieces. I was in college and once told her about my good grades. She beamed at me, and told me she was once the top of her class, before the invasion. She never finished her education. She sounded regretful. But, she said proudly, she was the top of her class. When she moved here to America, Grandma was utterly devoted to us. She exemplified the selfless love frequently described in the Bible, but one that is rarely seen in real life. She would wake up bright and early and do her morning walk, help us make our lunch, and send us off the school. When we came home, she would have dinner for us. She had several dishes that I still miss. One, a deep fried potato dish which would have me anticipating dinner all day long. Another was a scallion pancake. It was so good; once I shared it with a swimmer friend, and I accidentally signed myself up for requests for more food over the next year. Grandma never did master American cuisine though; one her inventions, peanut butter turkey sandwiches, never quite landed. Grandma knitted and sewed always had the best blankets and best bed. We used to jump in there and take a nap when she wasn’t in. My little brother claimed a spot next to her as a bedmate for a long while. My little brother said goodbye to her by nuzzling heads, something they did when he was little. Grandma even once knitted me a pair of thick purple slippers. I was so proud I brought the slippers as a middle school class artifact and showed my classmates. I never wore them. I was worried use would damage the slippers and I wanted to keep them forever. For as long as she could, all she did was help. She picked apples, did laundry, cleaned, cooked dinner, in a completely sacrificial, selfless way. She never asked for a day off, and never made it about her. For two decades years, she was always there, as a constant, perpetual background. When she started getting dementia, her attitude and intentions to help never for a second wavered, even if her actions became less and less so. In many ways, dementia showed the most honest version of her, and when she didn’t know anything, she was consistently trying to serve. A decade of dementia was hard for our family, and hardest on my parents. I would come home every couple of months, while my parents had a daily dose of her perpetual broken record questions, with no hope of growth of recovery or improvement. With a decade of fresh memories, It’s easy to focus on the pain, the frustration, and the things that she forgot and couldn’t do. But these aren’t the things that defined grandma. Grandma may have forgotten a lot of things, but she knew that she wanted to help us and give. Grandma also knew us. She knew all of us grandchildren, and she knew me. The day before she passed, we put her to bed and she beckoned me over and gave me a hug. Her arms wrapped around me and she pulled me in. Her mouth was dehydrated because she had stopped eating and drinking; it was hard to hear, but the message was clear. Instead, I was the one who wanted to thank her, for everything she had done for us. Later that night, when she closed her eyes for the last time at bedtime, she grabbed onto my hand, her grip urgent and strong. She still remembered and knew me, and I will always remember grandma for who she truly was: the loving, sacrificial woman who only wanted to help. Grandma, I will miss you as a constant in our family, we will always remember you and your selfless love, and I pray that I will see you again in heaven one day. Rest in peace.